MOSCOW (Reuters) - President Vladimir Putin told his security chiefs on Monday to ensure Russia does not follow what he said was Ukraine's example by letting the West use local civil rights groups to foment unrest. In a speech to the Federal Security Service (FSB), the KGB's main successor, the former spy called for more vigilance and better counter-intelligence to fight threats ranging from Islamist militants to computer hackers. But he signalled particularly deep mistrust of the West following protests that toppled Ukraine's Moscow-backed leader in February during the worst crisis in East-West relations since the Cold War ended in 1991. Accusing the West of funding radical groups in Ukraine that helped to topple President Viktor Yanukovich, he expressed concern that Russia also faced a threat from non-governmental organisations (NGOs) "serving foreign national interests". "Russia's laws today give us the conditions we need for non-governmental and public organisations to work freely and transparently. But we will never accept their being used for destructive purposes," he said. "We will not accept a situation like what happened in Ukraine, when in many cases it was through non-governmental organisations that the nationalist and neo-Nazi groups and militants, who became the shock troops in the anti-constitutional coup d'état, received funding from abroad." Western leaders have dismissed such criticism, mainly aimed at the United States and the European Union, and blame Putin for causing the crisis in East-West relations by annexing the Crimea region from Ukraine on March 21. 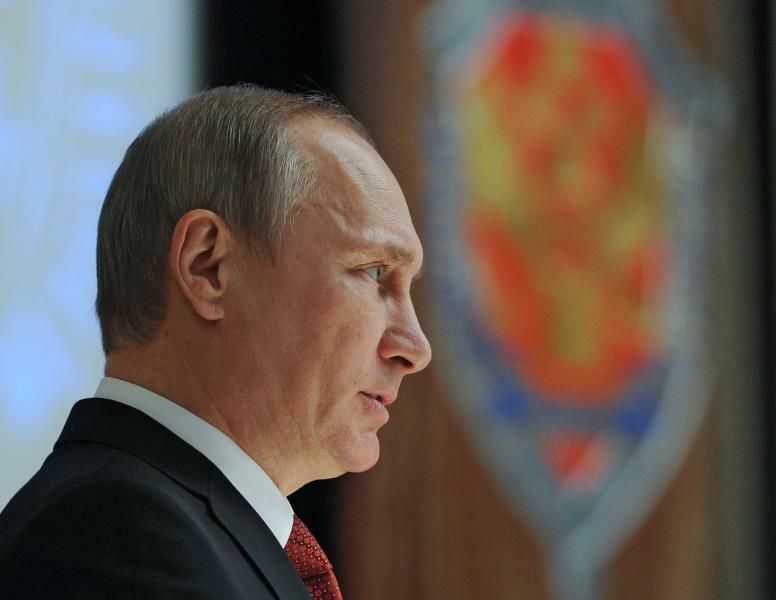 The West says Putin has already clamped down on NGOs to try to silence dissent, a charge the Kremlin denies. Soon after returning to the presidency in 2012, Putin approved a law tightening controls on NGOs funded from abroad, forcing any organisation that engages in "political activity" to register as a "foreign agent", a derogatory term harking back to the Cold War. It was not immediately clear whether his comments on Monday meant such groups would face new pressure, or whether other civil rights and lobby groups will now face harsh treatment from the FSB. Putin, who ran the FSB in the late 1990s and served as a KGB agent in East Germany, said 46 employees of foreign secret services had been uncovered by the FSB in Russia last year. That was an increase of almost one-third on 2012. 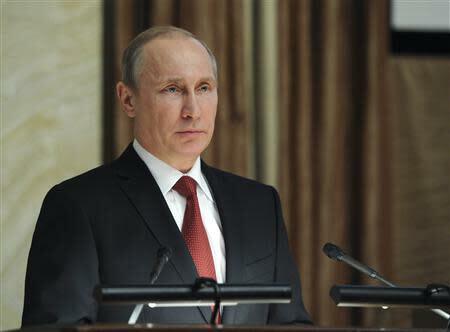 The speech continued the conservative tone of Putin's statements since the crisis began over Crimea but he made few specific references to events on the Black Sea peninsula apart from underlining the need for the FSB to operate there. He also made no reference to accusations by the West that he was behind separatist protests in eastern Ukraine on Monday. As well as stressing the threat from militants waging an insurgency for an Islamist state in Russia's mainly Muslim North Caucasus, Putin urged the FSB to develop Russia's border infrastructure in the Arctic, but gave no details. He also called for the FSB to step up operations on the southern border as U.S. and other troops leave Afghanistan, and said allies in Central Asia may need help to prevent destabilisation in the region.